I have a video of the kids doing some interpretive dance to The Fox, and it’s packed with comedy gold. 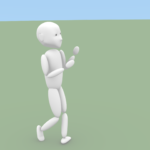 It also has a lot of variation in movements, good to study. Here’s an artist’s interpretation of how a few seconds of that went. This time I corrected one of the errors I made in my first animation attempt: I chose a much shorter sequence to animate. I made plenty of new misjudgments to counter that, though. I should have thrown together a character mesh and let it deform however it wanted to; instead I let myself get distracted in trying to understand the flow of edges. With moderate success. 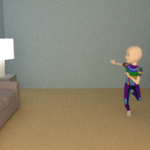 I also spent some time putting the action in a room with a TV and other objects, and making lamps. I’d planned to leave the couch as a rectangular prism, but this was annoying one of my kids. I should have told her to be happy she has a real couch to jump off of in real life and to leave my virtual boxcouch alone. But instead, I modelled a couch. Luckily for me, she isn’t feeling claustrophobic about that windowless room. Windows and curtains are not on my immediate list of things to practice in Blender. After all that I was able to get down to work moving the character around. I don’t know if I really convincingly captured the near-miss with the desktop, but it makes me laugh, so I’m reasonably happy. Yes, the toes are still poking into the floor occasionally. Just imagine there’s a carpet there, with a really high pile. I wrote a little more about the rigging, specifically the foot controls in the PitchiPoy version of the Rigify script. Love it! Makes me want to see more! Yeah, I know, it feels like a ripoff when it ends.